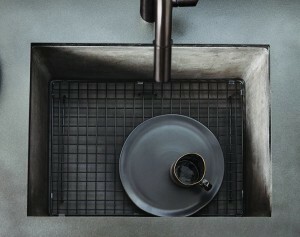 Farmhouse 2418 concrete sink and coordinating sink grid in stainless steel. Once you’ve done the hard part—or the fun part, depending on how into kitchen and bath design you are—of picking out the kitchen sink of your dreams, you’ll want to know how to protect it so that it remains the kitchen sink of your dreams. (No hyperbole here, we promise; there is, in fact, such a thing as a kitchen sink worth dreaming about. The farmhouse sink in particular has inspired more than a few sweet dreams. While there’s plenty out there on the subject of how to clean or polish your sink, there’s little on how to prevent damage to your sink floor—so often subject to high temperatures, abrasive surfaces, acidic foods, sharp utensils, harsh cleaning products, and so on. Farmhouse 2418 with coordinating grid. Surprisingly few people know about the easiest and most effective way to protect the bottom of your prep sink or kitchen sink from wear and tear: It’s the sink grid, or bottom grid (also called a sink grill), made to fit the size of your sink and to provide a buffer between the bottom of your sink and whatever you’re tossing into it. As a bonus, a sink grid will give you just enough of a cushion to safeguard delicate glassware (making them necessary for bar sinks) and to prevent food particles from sticking to your sink. This kitchen sink accessory is kind of like a sink’s insurance policy—offering you peace of mind that everything will be OK should a disaster (a heavy skillet) strike. And lots of people use them as a surface for quickly rinsing and draining fruits and vegetables. Pick a Native Trails kitchen sink, any Native Trails kitchen sink, and you can bet your (sink) bottom dollar that there’s a bottom grid custom made to go with it. From the 15” prep sink to the largest farmhouse sink, there’s a grid that’s will fit neatly on the floor of your basin. Cantina bar sink with coordinating bottom grid. Stainless Steel bottom grids coordinate with our Brushed Nickel sinks and our exclusive Mocha finish bottom grids coordinate with sinks in Antique Copper, so these bottom grids won’t detract from the look of your hammered copper sink. In fact, bottom grids for kitchen and prep sinks offer a custom look. 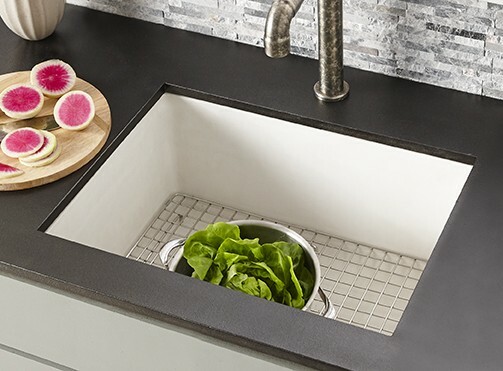 The NativeStone sinks in Slate, Ash, and Pearl work well with both bottom grid finishes, depending upon the drain and faucet that you have chosen; typically, the bottom grid coordinates with the drain and faucet. Each is fitted with a drain hole so you can use your sink as you normally would, and each is designed to prevent silverware from slipping through the slots. Sink grids are also made to be easy to clean—either in your dishwasher or with dish soap and water. Sink bottom grids are just one way to protect your kitchen or prep sink. Learn about the magical properties of copper sinks – take note of their ease of maintenance – and the benefits of sustainably-made NativeStone® sink.